One of the biggest issues plaguing the city of Bangalore has undoubtedly been its incapability to control the waste and sewage being dumped into its lakes. Bangalore, which is home to many lakes – Ulsoor, BTM and Bellandur for example, has seen pollutants spoil the natural beauty and quality of water in their lakes. Mahadevpura Lake is another example where the levels of pollution had reached an unbearable level and to mitigate this, Amazon India teamed up with the BBMP and United Way Bengaluru to construct a sewage treatment plant. There are many monitoring systems which will ensure that the STP works at an optimal level. The Centre for DEWATS Dissemination Society (CDD) and BORDA, a German Technology firm have provided technical expertise for installation of the STP. The civil construction is being led by Revlon Engineers. In order to prevent the further dumping and cleaning of the lake, the teams came together to create an eco-friendly Sewage Treatment Plant that would clean up to 1 million litres per day (1 MLD). Amazon is proud to be involved in the initiative as many of its enthusiastic employees came out in hordes in order to clear up the mess. 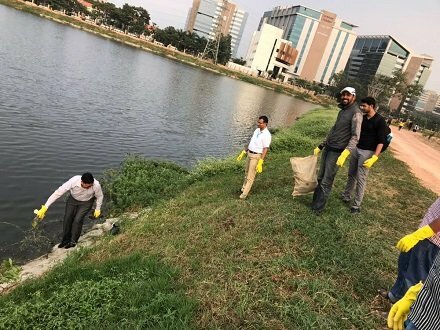 The “Wake the Lake” campaign featured multiple corporates around the city joining hands in an initiative to clear up one of the popular lakes in the city. Understanding the need to give back to the community and nature in general, Amazon bought a small army of employees interested in the project. They came and got themselves dirty in order to do their bit to cleaning up. Enjoying the process, Amazonians were involved in contributing to the campaign, which aims at having zero dependency on electricity for treating sewage water. Venkata Siva Rao Kota, Senior Manager, Software Development, Prime, who was at the lake with his team, said, "We come to work on this side of twon every day but really never knew that a lake exisited in this vicinity. Now that we here and we have seen first hand how our efforts can make a difference to this lake, we are all geared up to make a difference." Similar was the experience of Senior Manager, Fin Ops, Gaurav Prasad and his team. "Those of us in Bnagalore constantly hear of lake frothing and dying lakes. 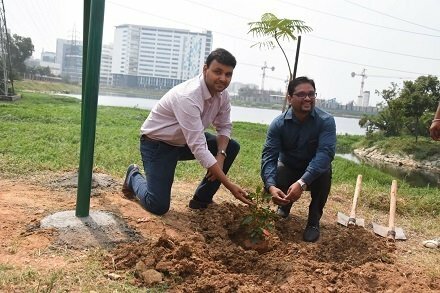 So, when we learnt that this lake in such close proximity to the office we decided to chip in with our efforts and helpe beautify the premises," said Gaurav. What is United Way Bengaluru? United Way Bengaluru (UWBe) established in 2008, is a not-for profit organisation that seeks to engage with and empower local communities. It is locally registered under Karnataka Society Registrations Act with 12A, 80G and FCRA compliance and ISO certification. It is also affiliated to Indian Institute of Corporate Affairs (IICA). UWBe focuses its efforts on education, livelihood, health and environment because they form the building blocks for a good quality of life. By collaborating with subject matter experts from different verticals of the society, UWBe is successful in developing high impact and sustainable solutions to local issues that benefits the entire community. “UWBe’s development initiatives are designed to ensure that corporates derive maximum impact from their investments. With water taking centre-stage in the push for cleaner and greener environments in recent times, this initiative is a step towards meeting the objectives of policy makers, corporates and civil society at large,” said Manish Michael, CEO, UWBe. “It makes us immensely proud and happy that we have the support of civil society and corporates and they are doing so much to make our city clean and green,” said B.V. Satish, Chief Engineer- Lakes, BBMP.